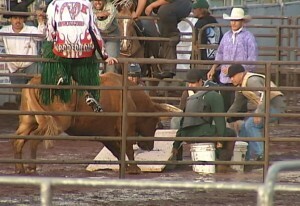 HILO, Hawaii: This weekend’s wet weather couldn’t put a stop to the Panaewa Stampede Rodeo. Sure, the mud was a little deeper, making it a little more treacherous to move around the Panaewa Equestrian Center here on Sunday. But when you’re at a rodeo, a treacherous path is a relative concept. For the 20th year, the Hawaii Horse Owners Association put on two days of roping, barrels, broncs, double mugging and Po’o Wai U. Rodeo Clown JJ Harrison returned this year to keep the spectators entertained during the down time in the program. 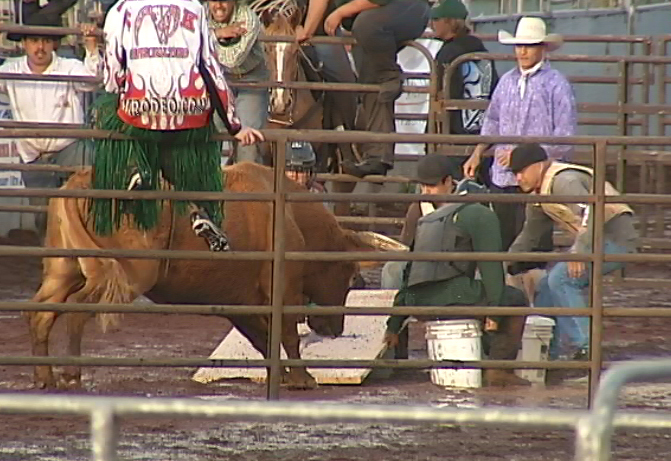 Our cameras were there to capture the final events of the 2012 rodeo… the hard nosed tradition of bull riding. On Sunday, paniolo after paniolo gave the bucking beast a try, in an attempt to stay on for the required 8 seconds in order to score… but ride after ride, the island’s cowboys were unceremoniously thrown into the mud. Just when it looked like there would be no qualifying ride the entire weekend, Dusty Miranda lowered into the chute, on top of “Hijack”, an ornery bull who had never before been ridden. If you have the guts to be the last man sitting, even as your fellow cowboy competitors are being tossed all over the place, you win… Of course, the crowd is does more gasping then cheering for this event. If you missed the action you can bet they’ll be back next year. The Hawaii Horse Owners Association’s mission is to create an all-volunteer organization dedicated to preserving Paniolo Culture and promoting partnership projects to upgrade equestrian facilities and members’ riding skills.